What are you doing for the holidays this winter? Spending time with family and friends? More than a dozen Near Earth Network engineers and support personnel from NASA’s Goddard Space Flight Center in Greenbelt, Md. and Wallops Flight Facility in Va. will be packing their bags and spending their holidays far away from their families at McMurdo Station, Antarctica for the austral summer. McMurdo Station is one of three permanent National Science Foundation stations in Antarctica. At McMurdo Station, which is the main U.S. station in Antarctica and 1,360 km (850 miles) north of the South Pole, the mean annual temperature is -18°C (0°F). Temperatures can reach 8°C (46°F) in the austral summer and -50°C (-58°F) in the austral winter. The average wind is 12 knots, but winds have exceeded 100 knots. 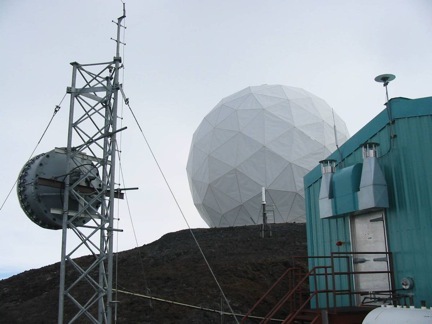 The team will perform crucial upgrades and maintenance activities to the Near Earth Network at McMurdo Ground Station in support of the European Space Agency’s latest meteorological satellite MetOp-A, which is already on orbit, beginning in March 2011. MetOp-A is the first in a series of three European meteorological operational satellites procured by ESA to serve as the space segment of the European Organisation for the Exploitation of Meteorological Satellites’ EUMETSAT Polar System. The McMurdo Ground Station will also support MetOp-B and C over the next 15 years. With a single 10 Meter antenna, hidden inside the radome in this photo, and associated electronics equipment, it has provided countless hours of space-to-ground communications support to dozens of Expendable Launch Vehicles and polar-orbiting satellites owned by NASA, other government agencies, and international partners. In addition to having a station at McMurdo, the Near Earth Network combines other NASA-owned stations with services purchased from commercially owned stations to provide support to a long list of missions. The upgrades will involve replacing the majority of the electronics systems in the ground station. The maintenance of the antenna system will be the most difficult and will involve using a crane to uncap the radome, disassemble the antenna, and replacing the antenna pedestal followed by reassembly of the antenna and radome. These activities will allow the Near Earth Network to support not only MetOP, but a host of other future missions. Goddard engineer Kevin McCarthy will lead this effort, providing project oversight and coordination with the National Science Foundation. In addition to reporting back to Goddard and the SCaN Program on day-to-day activities and status, he will be the primary blogger for the Near Earth Network McMurdo upgrades while in Antarctica. “I’m looking forward to my departure on November 6 and my scheduled return home on February 5, 2011, as well as sharing my team’s experiences with you on our work and life at McMurdo,” reports McCarthy. The Near Earth Network is the latest NASA Project to join the rising trend of blogging on day- to-day activities as part of NASA’s Blog Website under the title of “Summer on the Ice,” which will be updated regularly with news and photos of the site upgrades. You can follow the team’s progress by clicking here.